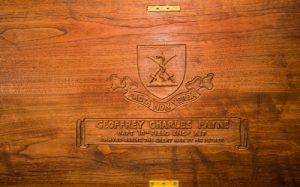 Chest carved 1916, Geoffrey Payne . Who was Nellie Payne? Inside of lid, chest for Geoffrey Payne. Geoffrey Payne was Nellie and Dr. Payne’s second child and elder son. He was born in 1890 in Hobart, prior to the family moving to Melbourne and then London. In England he firstly went to a local school near the family home, but soon afterwards was sent as a boarder to Felsted School in Essex. When the family returned to Hobart, he went to Brisbane to be trained and sit his land surveyor’s certificate. He later became a successful and respected land surveyor in Tasmania. He initially joined the Tasmanian railways survey party at Ulverstone but threw in this Government job and enlisted in 1915 as a private in the First Australian Expeditionary Force. He soon climbed the ranks and was a commissioned officer in the Australian Field Engineers, and within a year was in the thick of the fighting around Armentieres and in the Somme offensive. He was mentioned in despatches in 1918 ”for gallantry and distinguished services in the field”, and in 1937 was awarded ED for his service after the war with the local militia. After WW1 he worked in many parts of Tasmania including the Bass Strait Islands and surveyed the first road from Queenstown to Strahan on the West Coast in the 1930s . He married (Florence) Gladys Hawker in 1921 and moved into a historic home in Byron Street where Nellie carved their initials and wedding year into the mantlepiece panelling. 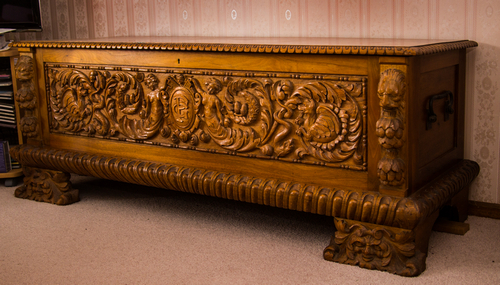 She also carved a bookcase/cupboard for this room. Geoffrey died in 1966, aged 76. His dower chest is very much treasured by his son, Charles.